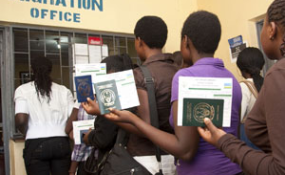 The announcement by President Uhuru Kenyatta that citizens of African countries would get visas upon arrival in Kenya has been met with mixed reaction. Mr Kenyatta, in his inauguration speech declared that this will NOT be done on the basis of reciprocity. "Today, I am directing that any African wishing to visit Kenya will be eligible to receive a visa at the port of entry. To underscore Kenya's commitment, this shall not be done on the basis of reciprocity," he said. "The freer we are to travel and live with one another, the more integrated and appreciative of our diversity, we will become. The political balkanization that risks our mutual security, the negative politics of identity, will recede as our brotherhood expands to embrace more Africans." He also announced that East Africans will be treated like Kenyans in while Kenya. "Our Brothers and Sisters in the East African Community; from today, you will be treated like Kenyans. Like your Kenyan brothers and sisters, you will need only your identity card. You can now work, do business; own property, farm and if you wish, and find a willing partner, you can marry and settle in Kenya," he said. "And this commitment we make with no conditions for reciprocity but driven by our desire for deeper regional integration." But the pronouncement has been met with both elation and skepticism.